NES Mighty Bomb Jack (JPN) "best ending" in 10:15.62 by Hisatoki. Mighty Bomb Jack is a game where Jack goes to rescue his family from a pyramid. Along the way, he meets many enemies who start as mummies and change forms when they hit the ground. 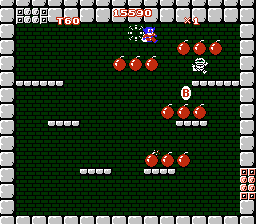 He also finds bomb-filled rooms at the end of each round, which work like warp rooms with a twist: you can warp ahead to the bomb room of the next round if the first lit bomb is the last bomb collected. Using this, the author warps past many rounds. However, this movie aims for the best ending, which is obtained by freeing all the family members in Round 12. This means that the author avoids warping past some rounds in order to collect items. For more details, read the submission comments.